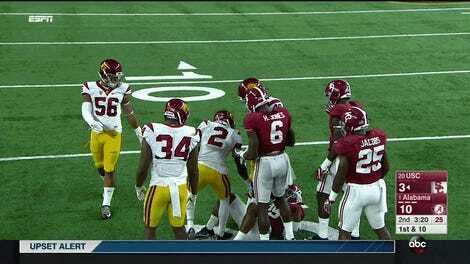 USC linebacker Jabari Ruffin will miss the first half of the Trojans’ game against Utah State after being busted for stomping on Alabama cornerback Minkah Fitzpatrick’s balls. That’s according to the LA Times, which also notes USC coach Clay Helton is ordering Ruffin to write an apology letter as part of the Sabanesque discipline. “Jabari is a good kid that made a poor, emotional decision,” Helton told a post-game press conference.